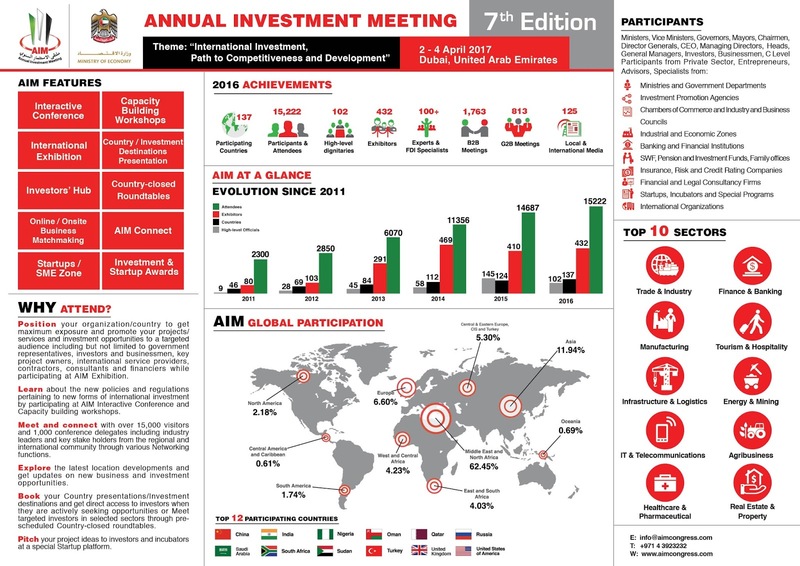 Dubai, UAE, 23rd October 2016: The 7th Annual Investment Meeting (AIM) is set to run from April 2-4, 2017, at the Dubai World Trade Center. Held under the patronage of HH Sheikh Mohammed bin Rashid Al Maktoum, Vice President and Prime Minister of the UAE and Ruler of Dubai, the theme of this edition will be “International Investment, Path to Competitiveness and Development”. 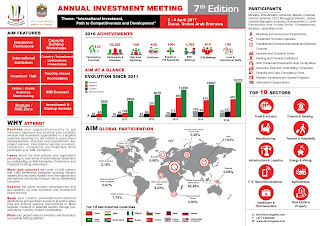 AIM gains a growing importance annually while holding its consequent editions, as it represents a leading platform for Foreign Direct Investment (FDI) in the emerging markets, through the promotion of investment opportunities in different sectors globally along with opportunities of connecting different government investors and delegations, competent institutions and organizations, and experts in addition to practitioners in the FDI industry from all over the world. The 2017 edition of AIM expects to welcome more than 15,000 participants, heads of states and governments, businessmen and investors from over 140 countries across the globe. H.E. Sultan Bin Saeed Al Mansoori, Minister of Economy in the UAE, said: "Preparing for the 7th Annual Investment Meeting 2017 comes at a time in which the global economic arena is witnessing several consequent developments, posing a number of challenges towards growth prospects in the global economy. The recent International Monetary Fund estimates for global growth rates came in the range of 3.4 percent by 2017. H.E. Al Mansoori added that the focus of the 7th edition of AIM is on the role played by foreign investment in boosting competitiveness and development which comes in line with growth requirements in the current period. The Minister of Economy referred to the positive results revealed through figures and data mentioned in World Trade Organization International Trade statistics 2015 which reflects the continued success of the UAE's economic policies year after year. These in turn have established the country’s status as an international trade hub, coming 16th globally in commodity exports and 20th globally in commodity imports. In the area of service trade, the UAE ranked 19th globally as service importer, and 42nd globally in service exports. He then said that the country continues to work on enhancing its competitive capabilities in different economic sectors to achieve the UAE Vision 2021 and its National Agenda. H.E. Al Mansoori clarified that Foreign direct investment (FDI) plays a vital role in promoting the competitive capabilities of countries’ economies, either in providing the capital or in the promising opportunities to convey modern and developed knowledge and technology, and in increasing production capacities and opening up to new markets boosting the country’s competitive ability. According to the World Investment Report 2016, Global FDI flows rose by 38 per cent to $1.76 trillion in 2015, the highest level since the global economic and financial crisis of 2008–2009. A surge in cross-border mergers and acquisitions (M&As) to $721 billion, from $432 billion in 2014, was the principal factor behind the global rebound. These acquisitions were partly driven by corporate reconfigurations (i.e. changes in legal or ownership structures of multinational enterprises (MNEs), including tax inversions). Over the medium term, global FDI flows are projected to resume growth in 2017 and to surpass $1.8 trillion in 2018. Promoting competitiveness is one of the main topics of discussion at AIM 2017. This comes at a time when the UAE rises to the 16th globally and the first regionally among the 20 most competitive economies in the world, according to The Global Competitiveness Report 2016- 2017 issued by The World Economic Forum (Davos) in Switzerland. This surpasses many of the advanced economies like UK, France and Belgium.